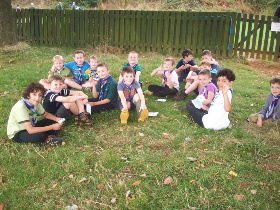 Fifteen excited Cubs arrived at the Scout Camp site at Horley on the evening of Friday 19th September. Ten of the Cubs were fairly new so hadn’t camped with us before while the other five had only been to our own Camp before so were not sure what a District Cub Camp entailed. Understandably, there was a lot of apprehension about the weekend ahead. As it turned out, the Cubs settled well into camp life and after they had spent an hour or so running around the camp site in the dark on the Friday night in small teams taking part in a Wide game, they were all more than ready for their first night at camp. After a snack supper and hot soup/drink, the Cubs got themselves ready for bed and were soon settled in their Patrol Tents, where they were sleeping in fours, fives or sixes. All the Cubs were up early the next morning and, after a hearty breakfast, were ready for flag break at 09.00 which signalled the opening of the day’s activities. The morning included a communal quiz based on Space then an amazing talk/presentation entitled “So how did we get to the moon?” which managed to capture the attention of the majority of the Cubs and Leaders for over two hours! After lunch, the Cubs split themselves into small groups and spent the afternoon working their way round different bases with various titles such as DNA, Constellations in Hand, Carrier Bag Parachutes, Astronaut Training, Space Pong, Fuel Rockets, Balloon experiments, Alien Hunt and Galactic Slime to name just a few. These bases continued on the Sunday morning, where the Cubs, armed with individual Passports, tried to complete and have signed off as many bases as possible. On the Saturday afternoon the Cubs also took part in an Archery session then in a Shooting session on the Sunday morning.